Thank you for your interest in Mountain Laurel Montessori School. MLMS accepts students on a rolling application basis and as we have openings in the classes. We encourage you to follow the application steps below to learn more about our unique community and a Montessori education for your child. Please contact our admissions staff at 540-636-4257 or contact us here with any questions or concerns. Schedule a visit to tour our school and observe the classes in which you are interested for your child(ren). Observation is key to learning about our unique environment. Call 540-636-4257 or send us a message here to make an appointment. Please see the schedule below for the monthly Visitors’ Day dates, where our directors and teachers join visitors to answer questions in an informal setting while enjoying a luncheon we provide. Complete and submit an application, by mail, for your child. Please include the appropriate application fee. Download applications here. Schedule a time for your child to visit the classroom. You will receive a follow-up call from a member of our admissions team or a teacher at your child’s level to discuss any questions you may have. If we are a good fit, you will receive a contract for your child for the current or following school year. Please return the signed contract with a deposit in a timely manner to hold your child’s place in class. 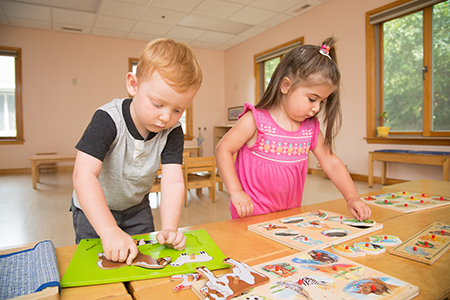 Mountain Laurel Montessori uses FACTS Management Company to handle tuition payments and to analyze financial aid applications. Once your child’s application has been processed you will be given the password to sign up online for a payment plan through FACTS Tuition Management. Financial aid may be applied for after enrollment deposit is received. All financial questions should be directed to Rose DiNinno, Business Manager at 540-636-4257 or through our contact form. Mountain Laurel offers open enrollment. Families can apply for admission any time of year.